Since buying my bike, I find myself cycling pretty often and I usually bring my camera along to take pictures. Usually taking photos involves stopping and fumbling around in my backpack for the camera – not an ideal situation. 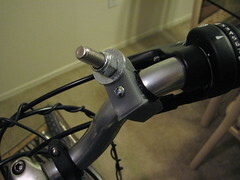 Naturally, the first thing I started thinking about after buying the bike was, “How can I mod this to make it uniquely mine?” While looking through Instructables for ideas, I found instructions for a bicycle camera mount. It dug it, and it had the benefit of being cheap, but was a little feature-anemic. 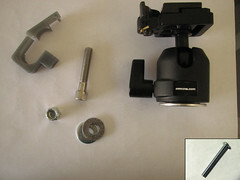 Specifically, it couldn’t tilt at all, so would result in unlevel pictures on my bike, and it wasn’t easy to remove the camera – you had to unscrew it from a bolt for unmounted shots. 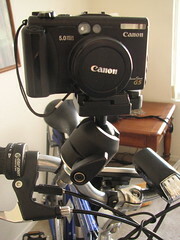 I immediately thought of tripods with quick release plates and decided on a simple remake using a tripod head. I made and attached it this weekend, with pretty excellent results! Now I can make photos while biking and easily transition to hand-held shots when I see something cool on the roadside! 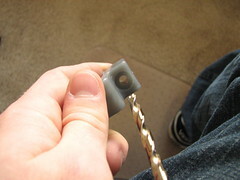 I published an Instructable for anyone interested in making one, and have a photoset up on Flickr. 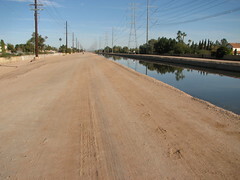 A sample photo taken along a canal - it's pretty level!